This closed in early 2014 and had a sign saying it would re-open after refurbishment in March 2014. It did not re-open and was repossessed by the landlord in June 2014. 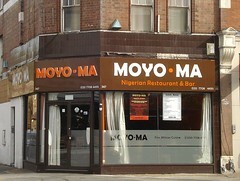 Nigerian restaurant in Walworth. According to their menu, the name means "I'm full, Ma!" The ground floor is fairly small, with cafe-style decor, seating only about 20 people. They also have a lower floor available for private bookings, seating up to 50.
secretlondon and Kake visited on a Sunday lunchtime in October 2011. We'd thought there would be a buffet on, but it turned out not to be happening, so we ordered a la carte. We were warned that secretlondon's choice of main would take 30 minutes to be ready, so we decided to have starters too. secretlondon started with garnished assorted meat (£5) photo, which turned out to be various types of offal (tripe, tendon, etc) with hot peppers. I didn't realise it was going to be offal and found it a bit unmanageable, particularly as the different bits seemed to all be stuck together. Kake's starter of chicken gizzard suya (£5) photo was more manageable, and also well-executed; the gizzards weren't chewy at all, and the raw onion garnish was just right to contrast with the meat. Kake's main of aganyin beans with plantain and meat (£8) photo was also good; very nicely savoury beans cooked to a good softness. Since I'd not had this dish before, they gave me the aganyin sauce on the side photo; normally it would be poured over the top. Even though the beans were good on their own, they were still better after mixing in some of this sauce, which was made from ingredients including ground dried fish and tomato purée. They gave me the option of having meat or fish with this; I chose fish, which turned out to be catfish photo. secretlondon's main was the okra special, described as an "exotic mix of seafood and stockfish" (£14) photo. I was asked whether I wanted beef and chicken in this; I said yes not realising that it would be offal again. The stew was interesting — it was made of okra that had broken down completely into a glutinous soup. There were some small bits of seafood in it — a few shrimps and some squid. There was also tripe, and cartilage and other things we couldn't identify. I had it with amala photo which is made of yam. It was quite hard to eat and too ambitious for me really. Although they are licensed, we both chose the Chapman non-alcoholic cocktail (£3.50) photo, a Nigerian drink made from Fanta, Sprite, and Ribena, garnished with cucumber and citrus fruit. This was nice and refreshing. No service charge was added to the bill, and when we tried to leave extra to cover this, they wouldn't accept it, insisting that we take all our change. secretlondon's verdict: It was interesting and next time I will have something less ambitious. I also need to check what "meat" consists of as I wasn't expecting offal. Kake's verdict: I'd come back too! I could happily eat those beans again. Accessibility: A step to get in, but no further steps to the toilet. The tables on the ground floor are fairly close together. Last visited by secretlondon and Kake, October 2011. Last edited 2014-07-31 14:38:53 (version 10; diff). List all versions. Page last edited 2014-07-31 14:38:53 (version 10).